The Nexo is a zero-emissions EV that offers the same range, performance and refueling time as a conventional ICE powertrain right now, not five years from now. It must be recognized. The fuel-cell race is heating up and Hyundai’s fun-to-drive Nexo leads the pack with a range of up to 380 miles (612 km), fuel tank packaging that does not compromise legroom or cargo space and a component strategy that will enable Hyundai to scale up production and lower costs. After being out of the spotlight for almost a decade, hydrogen-powered fuel-cell vehicles became available to the public in 2015, led by the Hyundai Tucson FCV and followed by the Toyota Mirai and Honda Clarity. The Tucson made our list in 2015, and the Clarity made it in 2018. FCVs no longer are delicate science projects. They are as durable and capable of operating in extreme temperatures as conventional internal-combustion engines. But Hyundai raises the bar significantly with the Nexo, making the most compelling case yet for high-volume FCVs for mainstream buyers. Based on a dedicated platform, it is a sleek and stylish crossover with the range and refueling time of a conventional CUV and it beats the others in its competitive set in all key categories. With such long range and less sensitivity to cold temperatures than battery-electric vehicles, we had zero range anxiety in this EV. 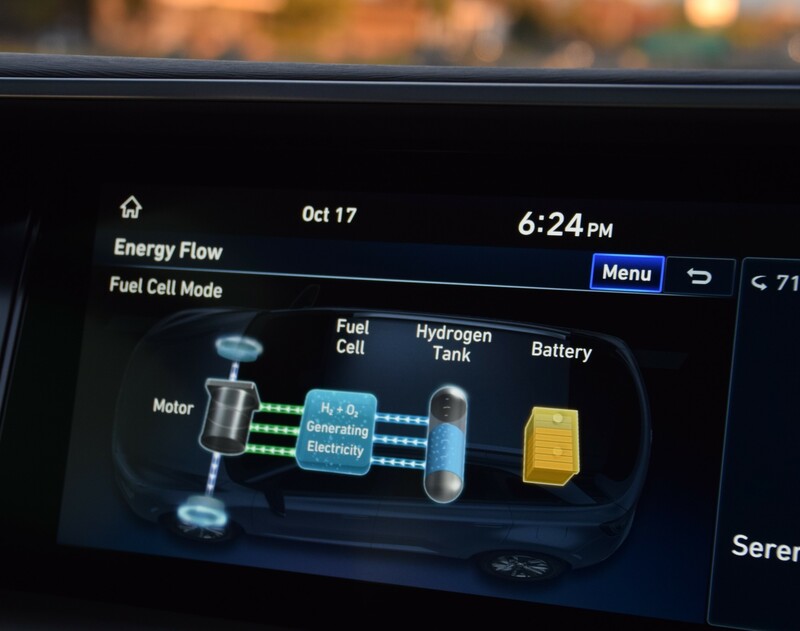 Of course, with 10 days of testing, it helped that there was a hydrogen pump at the Hyundai America Technical Center within range of WardsAuto’s offices. The Nexo accelerates from 0-60 (97 km/h) in 9.5 seconds and reaches a top speed of 111 mph (179 km/h), but it’s torquey electric drive makes it feel a lot faster. “Awesome drive quality: power, torque, silence and near-perfect feel,” says editor Bob Gritzinger. It is powered by a 95-kW fuel-cell stack and a 40-kW lithium-ion battery for total output of 135 kW, up from the 124-kW total of the outgoing Tucson FCV. The motor also is more powerful, producing 291 lb.-ft. (395 Nm) of torque, compared with the Tucson’s 221 lb.-ft. (300 Nm). It’s three seconds faster than the old Tucson FCV. Available only in California for now, it has a range of up to 380 miles (612 km) in its top Limited grade, and the entry-level Blue model has a 354-mile (570-km) range, compared with the Toyota Mirai and Honda Clarity FCV, which offer 312 miles (502 km) and 366 miles (589 km), respectively. And the Nexo also features the world’s first unified three-tank system, which uses three identical tanks rather than one large tank connected to a smaller one. The new tanks sit low in the vehicle chassis, creating the largest total interior space of any current FCV, and allowing a fully flat luggage area with generous luggage capacity. The tanks and related valves and other components are expensive. They hold hydrogen at 10,000 psi (690 bar), but Hyundai is lowering their cost by standardizing them and sharing the tanks and related components across its growing fleet of fuel-cell powered trucks and buses, which will improve economies of scale. The issue of a limited hydrogen refueling infrastructure always hangs over FCVs, but a fully developed high-speed EV recharging infrastructure also is far off. The Nexo is a zero-emissions EV that offers the same range, performance and refueling time as a conventional ICE powertrain right now, not five years from now. It must be recognized. Nexo display screen shows conversion of hydrogen and oxygen to create electricity.